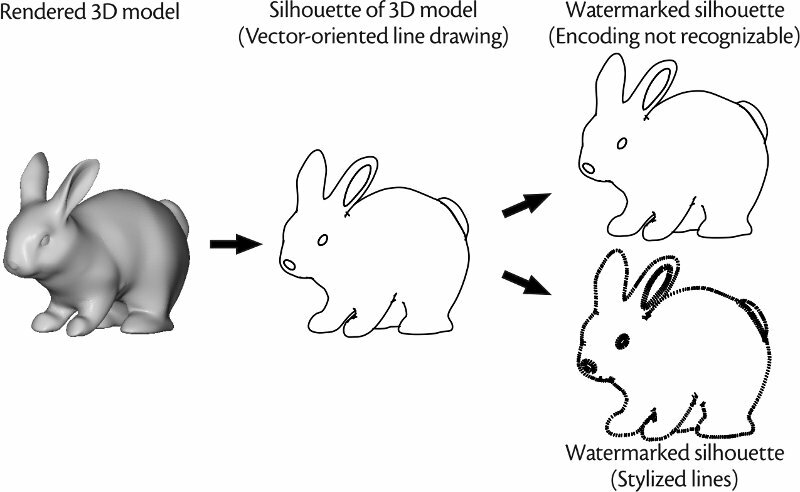 Digital watermarking is a technique for embedding information into data, such as images, 3D models, or audio ﬁles, such that some properties (i. e., security, imperceptibility, robustness) are maintained. While most of the existing watermarking techniques focus on encoding copyright information where security is one of the most important properties, we have developed algorithms for embedding Illustration watermarks, i. e., content-related annotations for the image. Robustness against common media transformations, high capacity, and blind detection are our aspired properties while security and the usage of secure keys are less important. The medium that we are using for embedding data are 2D vector graphics. We introduce algorithms that change line attributes, introduce new vertices in certain patterns, and replace existing stroke segments by new lines in a stylistic way. Based on the modiﬁcation they introduce, we categorize our techniques into whether they change the appearance of the image or not and whether the changes are perceivable by the naked eye or not. We demonstrate our techniques with silhouette lines obtained from 3D models. Such line drawings are a very common style utilized in many illustrations, in particular in the medical and technical domain.